Hey, FIU: Are you ready to bring back the Sunblazer? Call it nostalgia. Call it curiosity. Call it school spirit, revved up by the recent success of the football team. Call it whatever you like, but there is a small yet undeniable interest in an unusual relic from the university’s past: the Sunblazer, FIU’s first mascot. The renewed interest in the university’s former mascot coincides with the success of FIU football last season. While the team was marching into Riccardo Silva Stadium in October to face the University of Texas-San Antonio Roadrunners with a 5-2 record at their back, the Sunblazer was making a cameo in the homecoming parade outside. Working under the theme “Unleash your legacy,” the fraternity Sigma Phi Epsilon and the sorority Alpha Xi Delta paired up to create a Sunblazer theme for their entry in the parade. The float featured students in custom t-shirts and banners emblazoned with the Sunblazer name. Members of Phi Mu Alpha Sinfonia, a social fraternity for the musically minded, played in formation alongside the float. Carlos Cueto ’14 thinks that reviving the Sunblazer could help FIU athletics stand out. The Sunblazer was conceptualized in 1973 when the young university assembled the University Nickname Committee (yes, really). The five sports at the time—baseball, golf, tennis, wrestling and soccer, all for men—needed both a team moniker and a mascot to represent them. A group of students and faculty came up with several names. The Ambassadors and the Diplomats were considered because of the international nature of the university’s students. The Trailblazers was also among the leading suggestions because of the location of the campus right off of Tamiami Trail (also known as Eighth Street). The Suns was another suggestion. Currently both sophomores, finance major Natalia Cucalon, left, and recreation and sports management major Cristina Castillo showed their Sunblazer pride at homecoming 2017. Blucker’s own suggestion—combining “Suns” and “Blazers” to make “Sunblazers”—was added to the list of contenders on a universitywide ballot, and the winner was announced on April 27, 1973. Art student James Houk eventually won $100 for his full-color drawing of the Sunblazer. Whether the aesthetics have held up over time is debatable. “A foot. It looks like a foot. It looks like it’s out of Monsters Inc.,” said Tim Ramjattan, a senior finance major. FIU retired the Sunblazers name and mascot in favor of the Golden Panthers in 1987, which later became the current incarnation of just Panthers. Seven Division I teams also have a panther as their mascot, among them the University of Pittsburgh, Eastern Illinois University and Georgia State University. 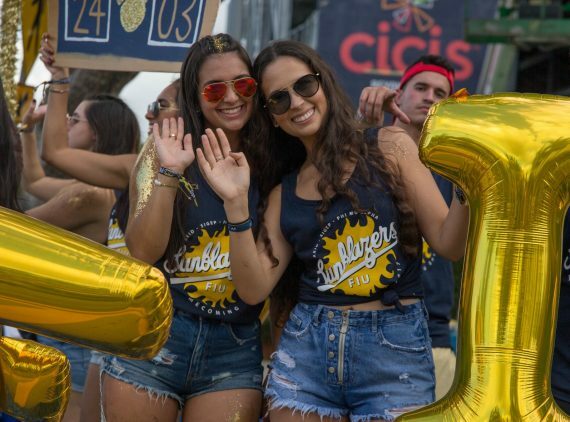 Whether or not the smiling, fuzzy costume returns in some form, FIU fans know that the goofy, charismatic half-sun-half-person is uniquely theirs. 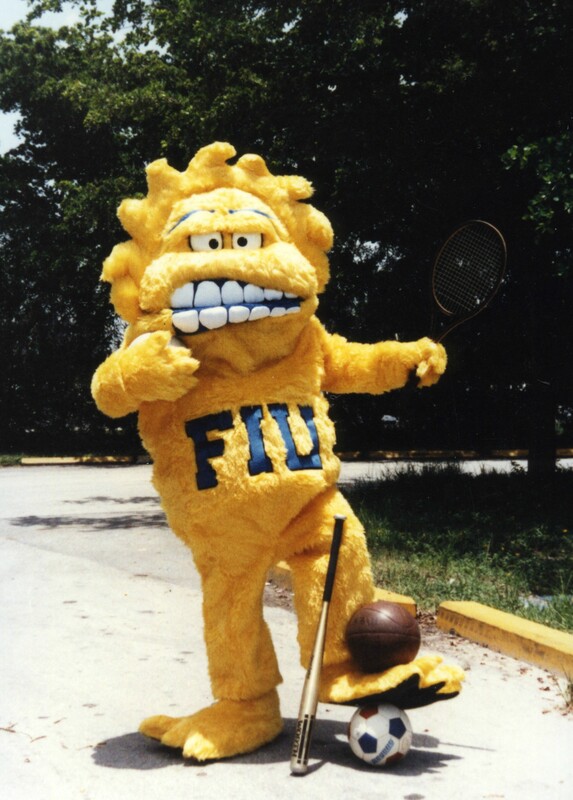 What do you think about FIU’s old mascot? Ready to have him back? Let us know in the comments section. Bring back the unique Sunblazer! I would love to have some throwback SunBlazer gear! Show our spirit and our growth! Yes! Sunblazers is unique, and there’s alot of cool branding we could do with Sunblazers. 100000000x Yes! To some extent, but I love Roary and as an Alumni, would be sad to see “my” mascot gone. Bring back the Sunblazer! I would buy some throwback gear. Don’t lose Roary though. FIU is great enough to have two mascots. One for the young and one for the no longer young. I was a committee member who voted for the Sun Blazers. Nice to see it return. Not only should FIU bring the mascot back, but they should revitalize the nickname. Sunblazers is unique and most appropriate for university striving to make a name for itself.